“How much longer?” is a constant refrain that we hear from Samhith, no matter where we go. However, this time, it wasn’t Samhith asking the question... it was our auto driver! We were on our way to the River Tern Lodge at the Bhadra Reservoir, from Shimoga, and having missed one bus, and unwilling to wait any longer, had decided to take an auto. Finding an auto ready to take us wasn’t easy... and neither was bargaining. However, we had clear directions from our hosts, plus, the driver of the bus which had brought us to Shimoga had been a well informed man, who had confirmed the route, and we convinced the auto driver that there was, indeed, such a place at the outskirts of his city. As the road wound on and on amidst the lush green fields, the driver grew more and more impatient, wondering where on earth we were asking him to go. He seemed to doubt us even when we pointed out a board showing us the way to the lodge... It didn’t help matters that the road was being repaired and we had to take a diversion. “I have never come here before. You are the first people coming all the way here... if you want a hotel, why don’t you take one near the bus stand?” were the multiple questions we had to field as we stuck to our guns and persuaded him that the lodge was “just a little further”! At last we turned a corner, and the canal was suddenly much wider... on its banks was a temple, and behind it we could get a glimpse of the reservoir... but where was the resort? Another narrow road led us along the wide expanse of water... and there... there was River Tern Lodge at last! Jungle Lodges has always been a favourite of ours. Shankar has been to many of their lodges, ever since his college days. 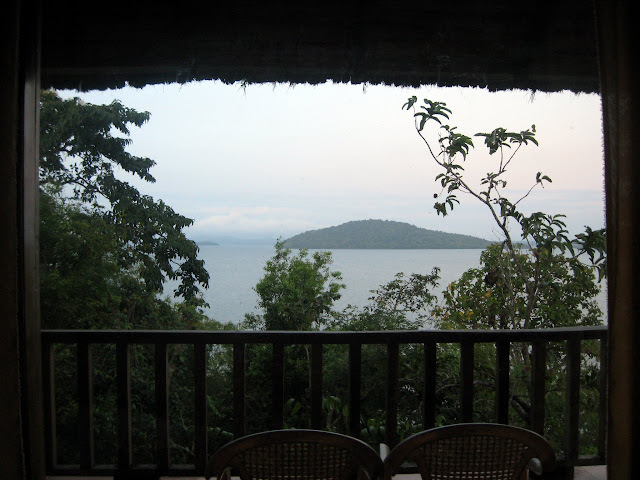 Our first trip post marriage was to their resort at Dandeli....we introduced Samhith to the delights of responsible wildlife tourism and birdwatching at their K.Gudi camp and their Sloth Bear resort was a perfect mixture of wildlife and heritage experiences! 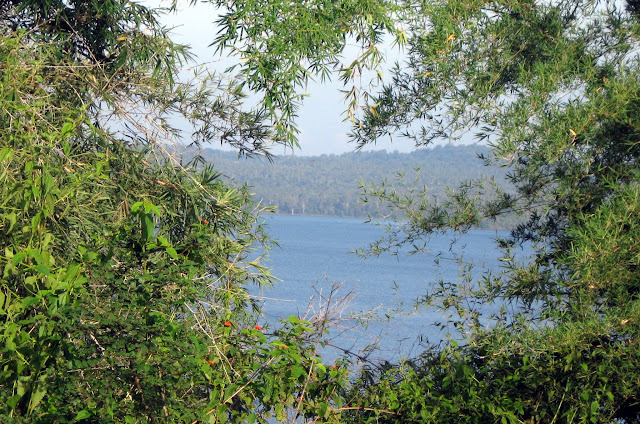 Kabini seems to elude us, but I am sure one day we will go there too...We appreciate their ideas, the way the resorts are organised and managed, and days spent there have been memorable, filled with activities, yet relaxing! While planning our trip to Sringeri, we had been looking forward to a day or two of relaxation, away from temples, preferably at some place far removed from civilization... we were trying to choose between two JLR properties – Devbagh near Karwar and River Tern at Bhadra. We were still trying to decide when I met Karthik during the Corbett trip. Hearing him talk about Bhadra was enough to convince me, and our decision was made. And that is how we arrived at the River Tern Lodge, almost exactly a year ago! 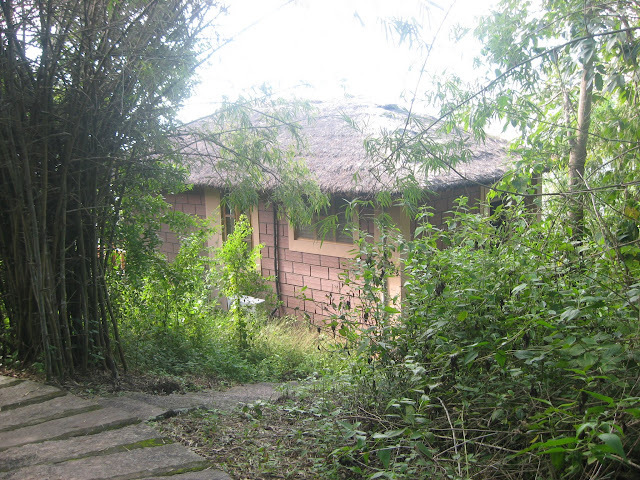 Our work at Sringeri and the time we had on hand had left us only two days at River Tern Lodge. The journey from Sringeri had been adventurous and memorable, but also tiring, and all we were looking forward to was crashing on the bed the moment we entered our room. However, our room was still a long way ahead. As we followed a young boy effortlessly carrying our luggage over a path which seemed to go over the mountain and amidst a thick forest, I panted and tried to keep up, wondering just how further our room was! We knew there must be rooms all around us, but nothing much was visible...except a glimpse here and there as we turned a corner. 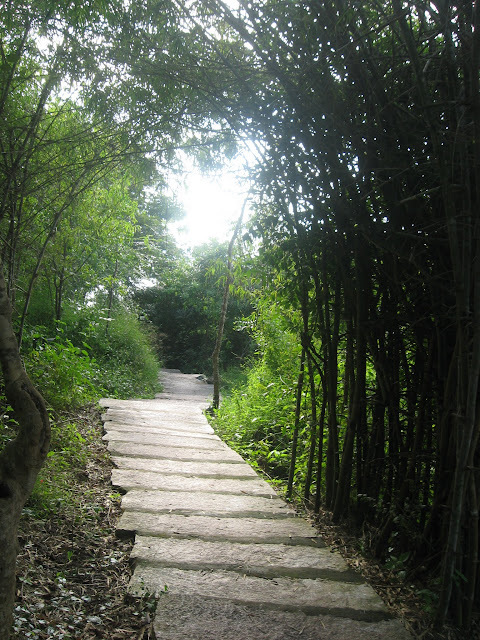 The trees seemed to muffle all sound too, because we could scarcely hear anything but the chirping of birds. It felt like we were all alone... and then, we turned off the path, and there was our room. 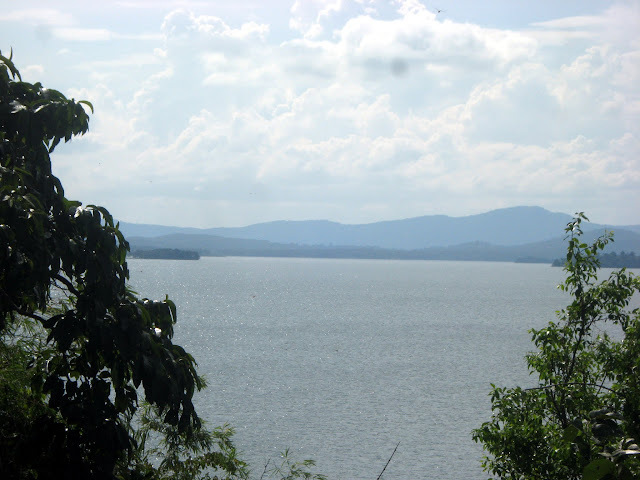 It was the Bhadra Reservoir! That was the view from the entrance to our room... ‘Stunning’ is too simple a word for it, isn’t it? I hope you are, by now, curious enough to know what our stay there was like... Well, that is another loooong story, so you will have to await my next post! JLR have got some great properties in wonderful locations and you should visit sometime the 'Old Magazine' house camp at Ganeshgudi near Dandeli that is my favorite hangout for birdwatching and leisure. Yes, Santosh. I have heard of it. I even remember reading about your birding experiences there.. There are so many wonderful JLR properties I want to go to, but somehow things dont always work out! This looks awesome!! I just put off my plans for River tern lodge for this Diwali. Have something else lined up. Thanks for sharing on how to reach the lodge from Shimoga. I had to browse a lot before i managed to find out. Such a useful article, Anu. My first visit to your blog via Mridula's blog. This is a place I hadn't heard of before. The picture looks refreshing too. Typically I enjoy reading travel related articles because I want to take my family to different places every vacation. Nice post, will keep track of forthcoming ones as well. Welcome to my blog, Sanand! and thanks so much! River Tern is just one of JLRs beautiful properties.. and really worth a visit! looking forward to more interactions with you! Beautiful place feels like eternal peace . Worth visiting at least once. So glad to have stumbled upon your blog! I've so much to explore still in south India despite having been brought up here. Do all the cottages at this lodge have this kind of view? Did your cottage have a name? Thank you,' sridevi. Every cottage here has such beautiful views. I really hope u get to explore more of our beautiful country... It's the main reason I write this blog, to make ppl aware of all the wonderful thins we have,so near ! Is this hotel/lodge anywhere near to chikmagalur? I'm planning a trip to this coffee estate area so let me know if i can accomodate it in my trip. 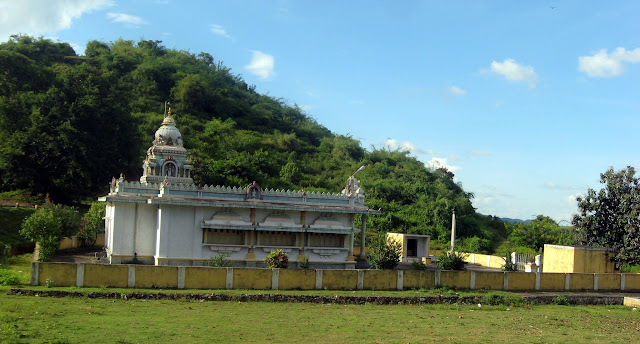 Shimoga is about 2 hours from chikmanglur so it's not too near. 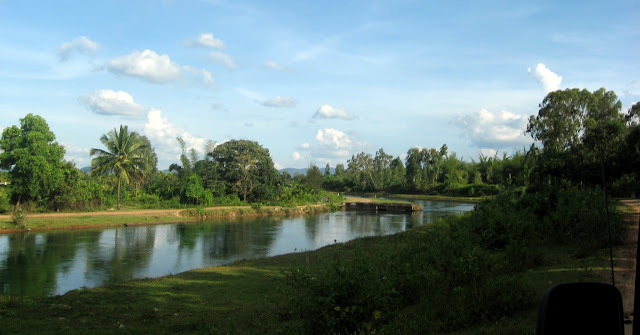 But you can combine a visit to chikmagalur with a visit to river tern.